WATCH: The Royal Wedding Of Prince Harry And Meghan Markle : The Two-Way The couple became the Duke and Duchess of Sussex upon getting married at St. George's Chapel at Windsor Castle on Saturday. According to Kensington Palace, Queen Elizabeth II will give a lunchtime reception for 600 guests at St. George's Hall in Windsor Castle on Saturday. The wedding cake, along with a selection of canapés and "bowl food," will be served. It is a royal family tradition to serve fruitcake at weddings, but not this time. Instead, the cake is a light sponge cake with a filling of Amalfi lemon curd, elderflower syrup and an elderflower buttercream. The elderflower in the cake actually comes from the elderflower trees at the Queen's residence in Sadringham. Pastry chef Claire Ptak designed the cake. 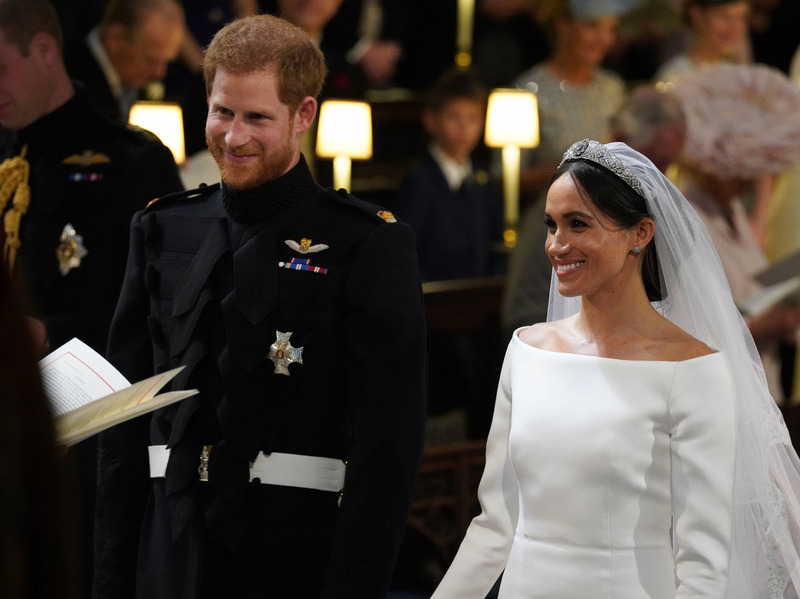 Prince Harry and Meghan Markle became the Duke and Duchess of Sussex upon their wedding at St. George's Chapel at Windsor Castle on Saturday. A note about Meghan, now the Duchess of Sussex: You've probably seen the word "biracial" used to describe her in multiple news outlets, including this one. NPR's Leah Donnella has reported on the words we use to describe people of multiple racial and ethnic backgrounds, including the term "biracial." "Biracial is, of course, another widely used term. It began showing up regularly in scientific papers in the 1970s, often referring to communities with both black and white members. But because of the specificity of 'bi,' meaning two, some argued that 'biracial' was too limited a term." Meghan has written about her identity herself, for Elle magazine in 2015. "Being biracial paints a blurred line that is equal parts staggering and illuminating," she said. She wrote about a time in seventh grade when she had to check a box to indicate her ethnicity. When she talked with her father about it, he told her later that she would need to make her own box. In the essay, she invoked her family history. "In 1865 (which is so shatteringly recent), when slavery was abolished in the United States, former slaves had to choose a name. A surname, to be exact. Perhaps the closest thing to connecting me to my ever-complex family tree, my longing to know where I come from, and the commonality that links me to my bloodline, is the choice that my great-great-great grandfather made to start anew. He chose the last name Wisdom. He drew his own box." The Duke and Duchess of Sussex have hit the streets of Windsor. They're traveling about town in a horse-drawn carriage. The carriage is called an Ascot Landau, which Crown Equerry Col. Toby Browne has described as a "wonderfully bright, small, lovely carriage." It allows its passengers to sit up high so that they can be easily seen from outside. The carriage was pulled by four Windsor grey horses — Milford Haven, Sir Basil, Tyrone and Storm. Two additional horses, named Plymouth and Londonderry, served as outriders alongside the carriage. The prayers are done. The final hymn, "Guide me, O Thou Great Redeemer," has been sung. The Dean of Windsor led the final blessing. Members of the royal family moved to the North Quire Aisle to sign the registers as the cellist Sheku Kanneh-Mason and the orchestra played. Kanneh-Mason, who is 19 years old, was the winner of the BBC Young Musician of the Year Award in 2016. He was the first black musician to win the award. The whole church, save for perhaps the queen herself, sang the national anthem. It, of course, features that famous refrain "God save The Queen." The newly married royals processed out of the west door of St. George's Chapel and stopped for a kiss. Harry and Meghan are officially man and wife – and the Duke and Duchess of Sussex. The Most Rev. Michael Bruce Curry of Chicago, the first African-American leader of the Episcopal Church, spoke about the power of selfless, sacrificial love. "There's a certain sense in which when you are in love and you know it, when someone cares for you and you know it, when you love and you show it, it actually feels right. There's something right about it." Curry quoted Martin Luther King Jr.: "We must discover the power of love, the power, the redemptive power of love. And when we discover that we will be able to make of this old world a new world." The speech was idealistic – at one point, Curry said that on the day when love had become the way of the world, there would be no more poverty. It was perhaps a fitting statement for the future Duke and Duchess of Sussex, who have both committed themselves to humanitarian and anti-poverty work. After the sermon, Karen Gibson and the Kingdom Choir sang "Stand By Me," the song originally performed by the African-American singer Ben E. King. The Lady Jane Fellowes, the sister of the late Princess Diana, gave a reading from the Song of Solomon. "Arise, my love, my fair one, and come away. Set me as a seal upon your heart, as a seal upon your arm; for love is strong as death, passion fierce as the grave." Prince Harry was just 12 when his mother, Diana, was killed in a car accident in 1997. Details on Meghan Markle's dress have been released. It was designed by British designer Clare Waight Keller, who last year became the first women to serve as artistic director at Givenchy. It's also important at this time, as the opening hymn has been sung and Markle's veil has been taken down, to make sure you've looked at the hat worn by Camilla, Duchess of Cornwall. Prince Harry and Prince William are seated near the altar. Harry has been joking with the crowd, but he appears appropriately nervous. Queen Elizabeth II and Prince Philip have arrived. The queen looks wonderful in a bright lime suit. Charles, Prince of Wales, and his wife, Camilla, have arrived, too. Markle's father will not be attending the ceremony because of his health, according to a statement from Markle. Charles will walk Markle down the aisle. A group of incredibly cute children will serve as bridesmaids and page boys at the wedding. They have arrived, too. And now, we've finally seen the full dress. The ivory dress is simple and elegant. There are stunning details on her veil and the train. Markle is walking down the aisle. The queen has given her official consent. About 2,640 attendees are gathering on the grounds of Windsor Castle. Tennis star Serena Williams has arrived. And in less than an hour, the ceremony will begin. Early Saturday morning, the official Order of Service was released. The service will follow Common Worship, the official series of services associated with the Church of England. The song that will end the procession of the bride and groom will be the Etta James recording of "Amen (This little light of mine.)" We've just spotted Meghan Markle and her mother, Doria Ragland, in a car on their way to the chapel. Markle is wearing a veil, and her white dress appears to have long sleeves, with a slightly off-the-shoulder cut. That's all NPR can reliably report for now. Harry has arrived with his brother and best man, William, Duke of Cambridge. He and William are dressed in military clothing – they both served in the British Army. They were greeted by cheers outside St. George's Chapel. The two men removed their gloves and hats before proceeding into the chapel. Harry's hair looks more kept than usual, but no, he did not go for the full clean-shaven look, as some predicted. According to the official Kensington Palace update, Her Majesty The Queen gave Prince Harry, whose new royal title will be Duke of Sussex, permission to get married in the uniform. It is the frock coat uniform of the Blues and Royals. The royal wedding of Prince Harry, 33, and Meghan Markle, 36, will take place on Saturday at St. George's Chapel, Windsor Castle at 7 a.m. ET (noon local time). Members of the royal family are expected to arrive starting at 6:20 a.m. ET (11:20 a.m. local time). Harry is scheduled to make his entrance with his brother Prince William, the Duke of Cambridge, at 6:45 a.m., followed by their grandmother Queen Elizabeth II. Just at the stroke of 7 a.m., the bride, Markle is set to arrive with her mother, Doria Ragland. Dean of Windsor, the Right Rev. David Conner, will conduct the service and Archbishop of Canterbury Justin Welby will officiate.